Melt the chocolate and butter in a heat proof bowl placed over a saucepan of simmering water. Stir to combine and until smooth in texture. Remove from heat and set aside to cool to room temperature. In the bowl of your electric mixer (or with a hand mixer), beat the sugar and eggs until pale yellow and thick, about 5 minutes. In a medium bowl, mix the cocoa powder, flour, baking powder, instant coffee powder and salt-sifting would be great to get rid of unwanted lumps Slowly add the dry ingredients and continue mixing until incorporated. Add in the eggs and sugar pure vanilla extract and mix to incorporate, then add melted chocolate, mix until it is smooth in texture. Fold in the dry ingredients by adding wet mixture to flour mixture, and gently fold until all incorporated. Stir in Chocolate Chips and if you like you may add some nuts if you desire. Cover the bowl with plastic wrap and refrigerate the batter just until firm, about 45-60 minutes but it could be in the fridge even overnight. When you take it out of the fridge it will be firm and you can take your ice-cream scoop or a round tablespoon and just add amount of cookies that you would like to bake. My baking pan is standard rectangular pan so I just added 9 cookies per pan, lined with parchment paper before baking. Preheat the oven on 350-375F, depending on your oven. Once on the baking sheet, form the cookies. You may add less or more to be thicker like mine. 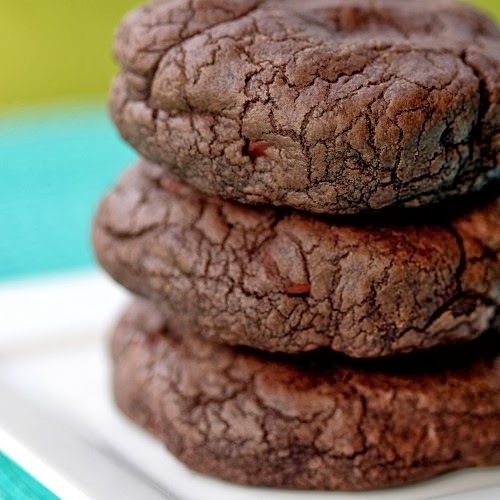 Bake between 10-14 minutes, depending again on your oven and the thickness of your cookies. DO NOT over bake them. When the cracks start to show, it is done, so check after 10 minutes and see if they need bit more time. Pull them out and let them cool down on the baking pan for about 10 minutes until they are set and ready for you to move them on a cookie rack to cool completely.